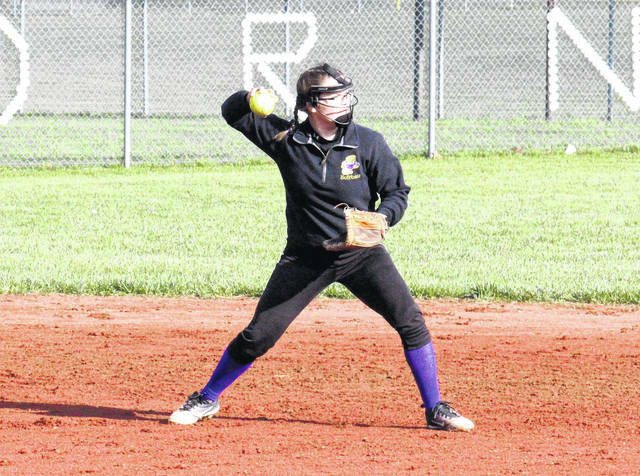 Southern sophomore Kassie Barton throws to first base, during the Lady Tornadoes’ 25-2 victory over South Gallia on Thursday in Racine, Ohio. RACINE, Ohio — Score a lot, or score a little, the Lady Tornadoes can win either way. 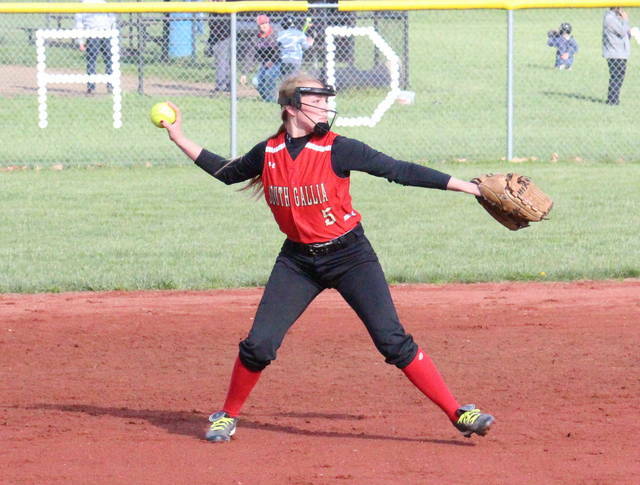 The Southern softball team completed a doubleheader sweep of Tri-Valley Conference Hocking Division guest South Gallia on Thursday at Star Mill Park, as the Lady Tornadoes followed a 25-2 mercy rule win with a 5-0 no-hitter. In the opening game, South Gallia jumped out to a 1-0 lead, as Isabella Cochran singled home Olivia Hornsby in the top of the first inning. In the bottom of the frame, Southern (9-3, 8-1 TVC Hocking) tied the game, as Jaiden Roberts scored Sydney Cleland sacrifice bunt. With two outs in the inning, the Lady Tornadoes took a 3-1 lead on a Lauren Lavender two-run home run. SHS added on to its lead in the second inning, as Roberts scored on a two-out error, making it a 4-1 game. The Lady Rebels scored their second run of the game with two outs in the top of the third, as Madisyn Spurlock singled home Destiny Johnson. However, SGHS didn’t reach base again in the contest. Highlighted by a three-run Shelbi Dailey home run, Southern scored 15 times in the third inning and headed into the fourth with a 19-2 advantage. SHS tallied six runs on six hits and four walks in the bottom of the fourth, wrapping up the 25-2 victory. Cleland was the winning pitcher of record in a complete game for Southern, allowing two earned runs on three hits, while striking out six batters. Spurlock suffered the loss for SGHS, allowing 19 runs, nine earned, on 17 hits and a walk, while striking out one batter in three innings of work. 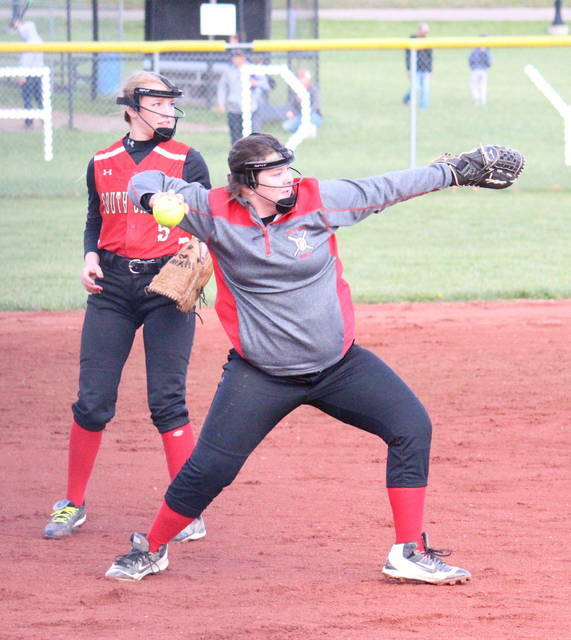 Mackenzie Martin pitched the final frame for South Gallia, allowing six earned runs on five hits and four walks. Paige VanMeter led the Lady Tornadoes at the plate with a 4-for-5 game, which included three runs scored and two runs batted in. Cleland went 3-for-4 with a double, a run and six RBIs, Roberts was 3-for-4 with a double, three runs and one RBI, while Josie Cundiff was 3-for-5 with a double, three runs and two RBIs. Dailey, Lavender and Kassie Barton were each 2-for-3 in the win, with Dailey posting a home run, two runs and four RBIs, Lavender recording a home run, three runs and two RBIs, and Barton picking up three runs and one RBI. Kaitlyn DeLaCruz doubled once, scored twice and drove in two runs for Southern, Sydney Adams singled once, scored once and drove in one run, while Jordan Hardwick singled once and scored once. Baylee Grueser, Avery King and Abby Rizer contributed a run apiece to the SHS cause, with Grueser also earning an RBI. Spurlock, Cochran and Johnson each singled once for the Lady Rebels, with Spurlock and Cochran earning RBIs. Johnson and Hornsby scored a run apiece in the loss. South Gallia was responsible for all-4 of the game’s errors. Southern left six runners on base, four more than the Lady Rebels. 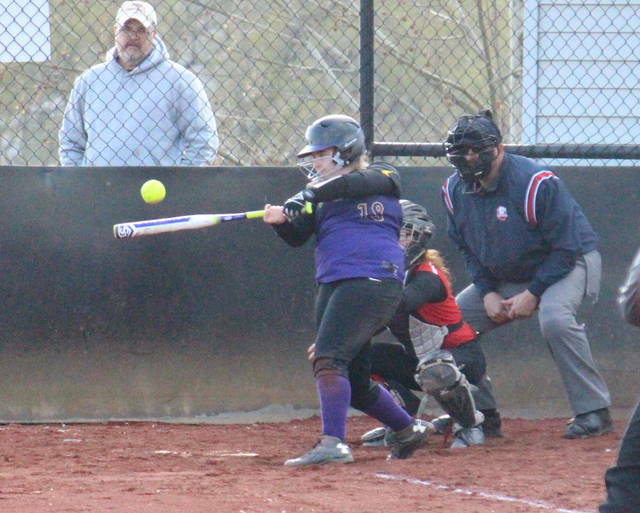 The second game — featuring the Lady Tornadoes as the visiting team — remained a scoreless tie for the first two innings. SHS went up 2-0 in the top of the third inning, as VanMeter singled home Hardwick, and later scored on an error. The Lady Tornadoes doubled their lead in the following inning, as Barton singled home DeLaCruz, and then scored on a single by Cundiff. The final run of the five-inning game came in the top of the fifth, as Lavender scored on a two-out error. Cleland earned the pitching win with a complete game no-hitter, which featured a trio of strikeouts. Makayla Waugh took the loss for South Gallia, giving up five runs, two earned, on six hits and a pair of walks. Waugh struck out four batters in five innings of work. Barton led the SHS offense with a 2-for-3 game, including one run and one RBI. VanMeter singled once, scored once and drove in one run, DeLaCruz singled once and scored once, while Cundiff had a single and an RBI. Dailey contributed a single to the winning cause, while Hardwick and Lavender added a run apiece. Southern committed two errors and left six runners on base, while South Gallia had five errors and one runner left on base. The Purple and Gold are on their home field again on Monday when they welcome Eastern. After hosting Federal Hocking on Friday, South Gallia is slated for a non-league matchup at Ironton St. Joseph on Monday.